LA PAZ, Apr 30 2013 (IPS) - Ana Chipana, from Bolivia, did not like eating quinoa when she was a girl. But this grain-like crop native to the Andes was her ticket to becoming a successful entrepreneur who has visited NASA and the United Nations. Chipana moved to the United States 12 years ago with her husband Ramiro and lives in the city of Tamarac in southern Florida. When he fell ill with a serious gastrointestinal ailment, she was forced to change her family’s eating habits, she told IPS by phone. She remembered the traditional diet she ate as a little girl in Bolivia, especially quinoa (Chenopodium quinoa). Quinoa contains up to 23 percent protein – over twice the level in common cereal grains – as well as carbohydrates, all of the eight essential amino acids, iron, calcium, magnesium, phosphorus and vitamins. It is easily digested, has a low fat content, and is gluten-free. “It represents a rich source of nutrients, is nearly complete as a source of protein, minerals, vitamins and energy, and as a crop has a high level of environmental tolerance,” FAO spokesman in Bolivia Einstein Henry Tejada told IPS. Like the potato, quinoa was a staple crop in the pre-Inca and Inca cultures in the Andes. But it gradually fell into disuse, and today it is not widely consumed in Bolivia, although it has become increasingly popular in the United States, Europe, China, and Japan. When her husband recovered, Chipana realised that she could help bring the health benefits of quinoa to others. In 2010 she founded a small company, Wara Quinoa Organic Bakery, in Tamarac. Her bakery sells organic baked goods made with quinoa flour, that are free of sugar and gluten. Her story is one of tenacity and drive. She wrote to NASA (the U.S. National Aeronautics and Space Administration) three times, to present her healthy products. Her persistence paid off last year, when the space agency invited her to serve a breakfast at a conference for astronauts and technicians. NASA has known about the nutritional qualities of quinoa for decades. The agency, which has its own laboratory of nutritionists and scientists carrying out R&D in space food and packaging, does not hire outside companies. But curiosity about her coffee cakes, muffins and cookies won out in the end, she said. “The chef and the astronauts told me that quinoa forms part of their diet, both in space and on earth. At the Space Center (in Cape Canaveral) they eat quinoa in salads, and in outer space they eat freeze-dried food that ranges from shrimp cocktails to sweet and sour chicken and hamburgers made of grains, including quinoa,” Chipana said. The photo of her standing next to veteran space shuttle astronaut James Reilly holding one of her coffee cakes has spread on the social networks in Bolivia, becoming an unintentional symbol of the government’s campaign to encourage the local and international consumption of quinoa. President Evo Morales is seeking to make quinoa one of the staple foods in the Bolivian diet. Bolivia is the world’s top producer of quinoa, producing 51,000 tons a year, most of which is exported. The United States is the main buyer. According to the Bolivian Institute of Foreign Trade, quinoa fetched 3,000 dollars a ton in 2012. Quinoa exports brought in 80 million dollars in 2012, 26 percent more than in 2011. And in the last four years, domestic consumption rose from 4,000 to 12,000 tons a year, or 350 grams to 1.1 kgs per person. At Bolivia’s urging, the United Nations declared 2013 the International Year of Quinoa. Because quinoa was only eaten in native highlands communities and poor urban neighbourhoods, “consumption levels were low, but the internal market is starting to grow,” President Morales told the U.N. General Assembly on Feb. 20, when the international year was announced. 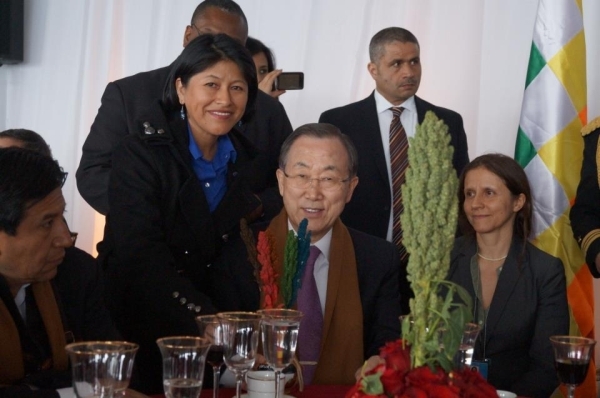 Chipana was there too, and served her baked goods in a lunch attended by Morales, U.N. Secretary-General Ban Ki-moon and FAO (Food and Agriculture Organisation) Director General José Graziano da Silva, among others. But Chipana said it was “very difficult” to break into the market, as few people were familiar with quinoa. She explained that she had better luck “with Anglo-Saxons, because they know about the nutritional values and organic characteristics of quinoa,” than with Latinos. And she has only managed to sell her products in organic food stores, she added. Quinoa grows “in poor, arid, saline soils that are also subjected to extreme climate conditions during more than two-thirds of the annual harvest cycle,” Tejada said. The expansion of monoculture farming further impoverishes soils, which require crop rotation and the recovery of native fauna and flora in order to maintain soil fertility and environmental balance, he said. Although this country of 10 million people reduced the poverty rate from 61 to 45 percent between 2005 and 2011, according to official national statistics, one million people still suffer from some degree of hunger, malnutrition or food insecurity, as indicated by statistics presented by FAO representative in Bolivia Crispín Moreira. But that is down from two million in 2008. “To reduce hunger and poverty, which are mainly concentrated in rural areas where promising means of life are scarce, FAO recommends a two-pronged approach: improving the sustainability of production systems and ensuring access to food,” Tejada said. Ban Ki Moon is Asian so he is a Rice eater.